The main body of the text should be written using the Arial font and single spacing with 10-point interlining spacing. Be sure your text is fully justified—that is, flush left and flush right. Please do not place any additional blank lines between paragraphs. All margins should be set at 2.5 cm. Figures and tables should be centred, numbered and accompanied by a caption. Please indicate in the abstract your preference for oral or poster presentation and underline the name of the speaker. Authors will be notified about the acceptance of their presentations by June1th 2016. September 21 - 23. The conference is aimed at exploring and discussing the latest trends in research and technology in the fields of green chemistry and nanotechnology in polymer chemistry and their contribution to a sustainable biobased and innovative industry. The conference is aimed at exploring and discussing the latest trends in research and technology in the fields of green chemistry and nanotechnology in polymer chemistry and their contribution to a sustainable biobased and innovative industry. 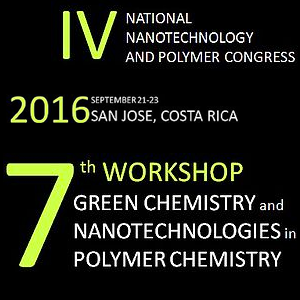 We look forward to welcome you in September 2016 in San José, Costa Rica.